Night scenes are intriguing. The mood, the mystery, and the drama are a setup for more interest, more attention. It took me a long time before I had the nerve to attempt a night painting. I figured the values alone would defeat me. But eventually I persevered and finally realized that a good night painting is a great lesson in the basics of painting. Don’t wait to try one. It’s a fantastic way to understand how to use dark colors, how to mix subtle values, and how to use black. The painting above by Winslow Homer has got to be one of the all-time greatest nocturnes out there. This one single painting influenced my career and changed my portfolio. The blue on the horizon makes the water completely believable. But it’s the wave climbing up across that blue that’s sweet. I use this Mead Scheaffer in my online classes for composition study, but it’s great for understanding value ranges as well. The guy in the middle, with the staff, is just perfect and holds my attention. Not all night paintings have to be greyed down. 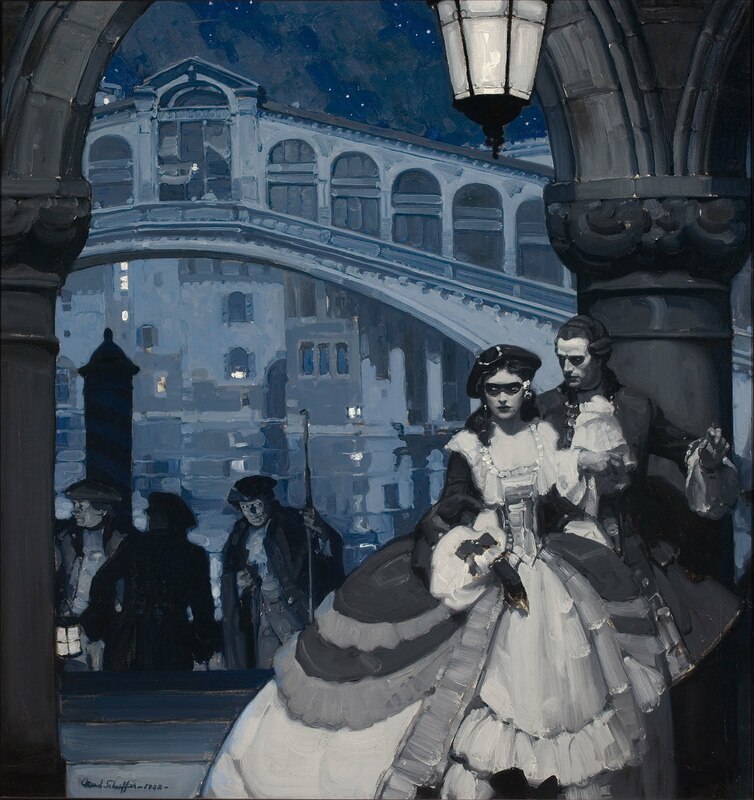 Letting the background of the composition go dark can hold the scene for the light and color to show off. 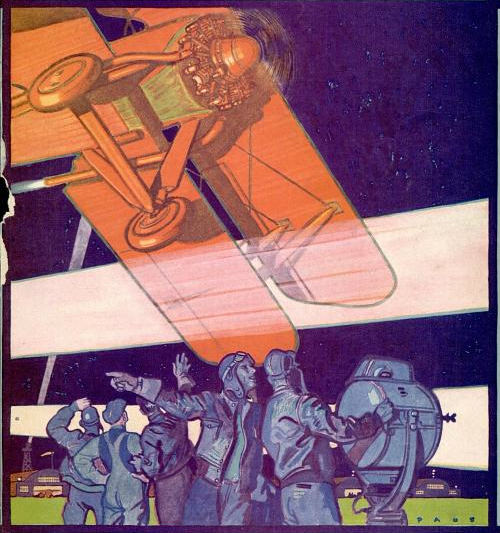 On this cover for Popular Mechanics by Herb Paus, the reflection on the engine cowling is just right. 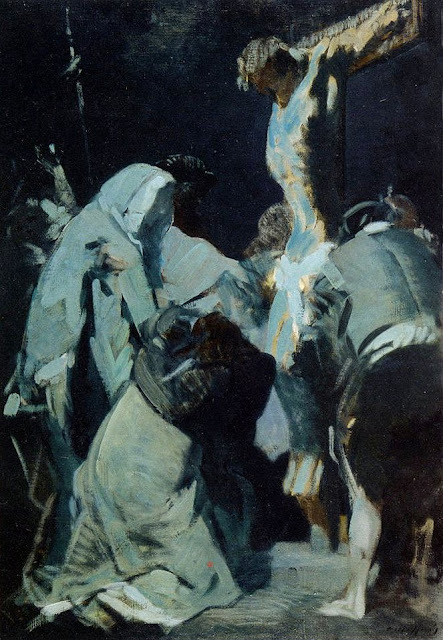 There are not many religious paintings that I’m drawn to, but this one by Ottavio Mazzonis holds my attention. It’s interesting for it’s minimal, but fully recognizable, portrait of Christ. But that great hood on the figure capturing the moonlight is perfect. 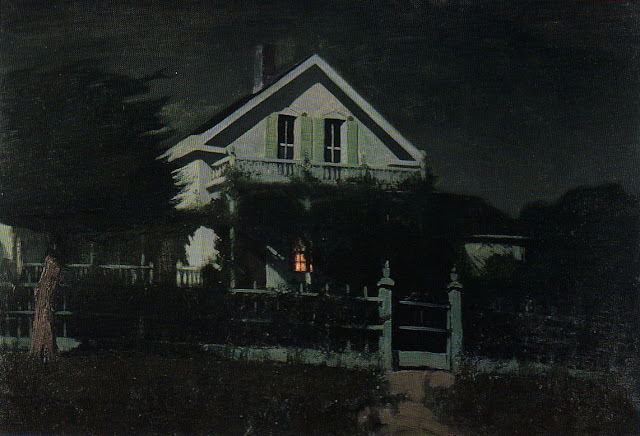 It’s too easy to suggest that the window light in this piece by Charles Rollo Peters is the passage, but I’m attracted by what supports it, like the slightly warm value of the front steps, or the stroke of flashing on the chimney. The spot that nails it, though, for me, and it’s more of a dot, is the bright star on the upper left. The Slav Epic by Mucha is a killer series, if you’re not familiar with it. And most of them are 15 to 20 feet wide. They’re gigantic. 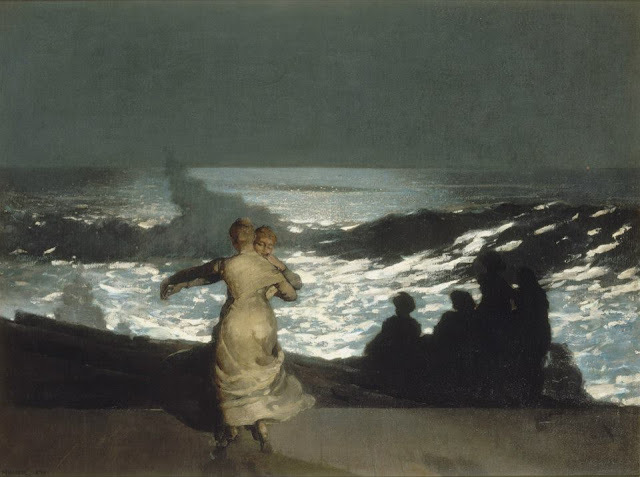 There are many perfect passages in this piece, but I love the way he’s controlled the value of the drapery running down from the main floating figure. What in the heck is going on here? I have absolutely no clue, and don’t care. 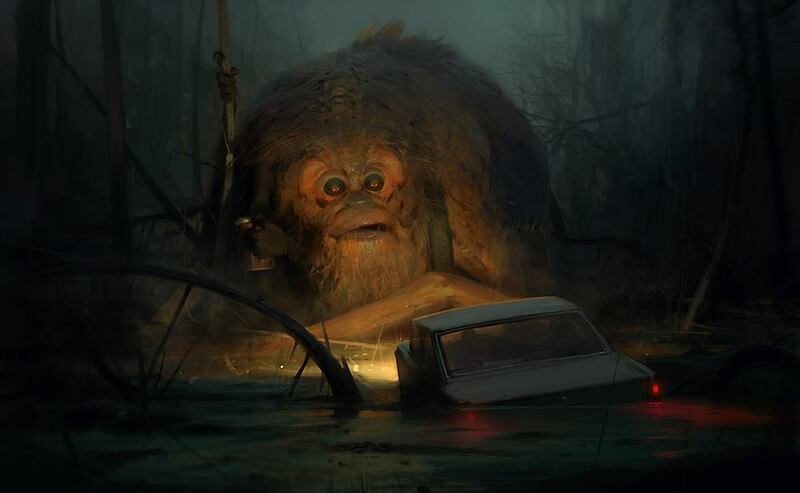 I can just stare at this piece by Sergey Kolesov and be awed. I’m fascinated by the way the spine moves up and bends gently to the right over the creature’s back. 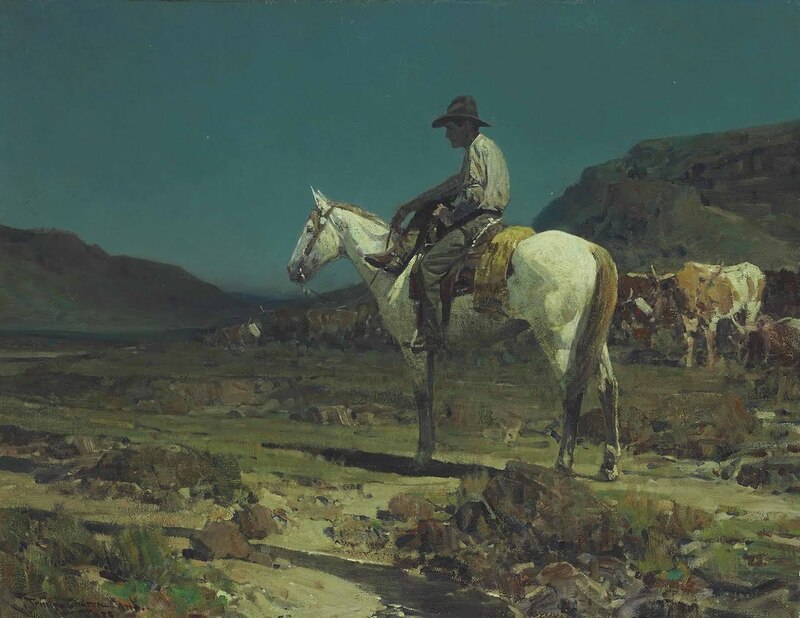 Frank Tenney Johnson was a marvelous western painter, and specialized in night scenes on the range. This is one of many similar scenes. He had horse anatomy down solid, like the rear ankles here. The perfect passage is where the light rolls over the horse's shoulder, casting the shadow from his boot. 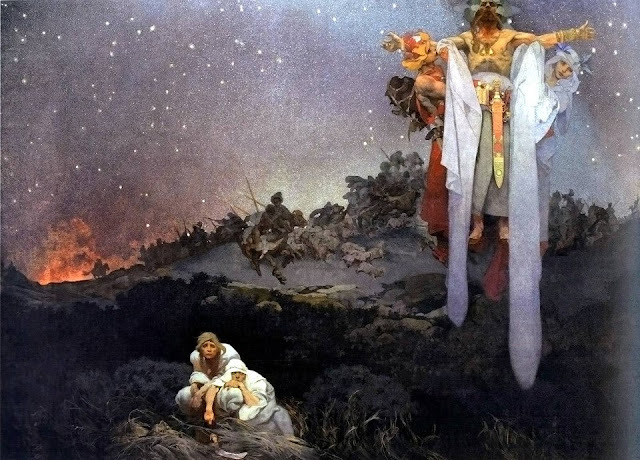 Ending with a grand nocturne from NC Wyeth for Kidnapped, "The Wreck of the Covenant." I like the fear and loneliness this painting projects. I fell the ship moving away. The moonlight that hits the sails is...perfect.